The beautiful Chic Spring Beret pattern has been kindly donated to p/hop by talented designer Jane Crowfoot and the staff at The Knitter magazine. This slouchy-styled Fair Isle beret is a sweet accessory for cool spring days. It looks great worn with both short hair or long hair and flatters most faces – the young and not so young! 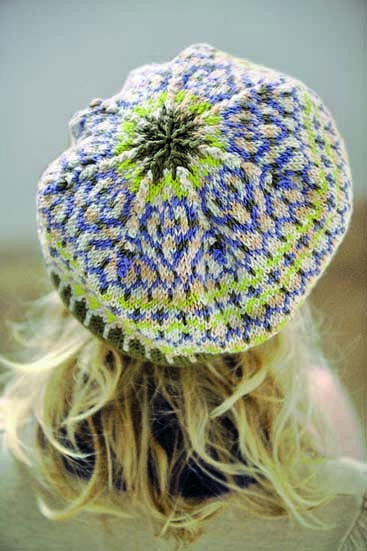 The beret is knitted using the Fair Isle technique in the round. Jane advises that when holding the second colour in your left hand, be careful not to pull the yarn too tightly as this may cause puckering. The pretty beret is knitted in four delicate shades of a soft DK weight acrylic yarn though a wool based yarn would work equally well. To see what others have made from this pattern, please visit the Chic Spring Beret pattern page on Ravelry.